Italian painter and draughtsman. He was trained by Giovanni Antonio Scaramuccia (1580-1633). Towards the mid-1630s he moved to Rome. His art owes much to Bolognese classicism and, in his last period, to Carlo Maratti. Most of Cerrini s paintings are undated, and, since his style apparently developed little, a chronology on stylistic grounds is hard to establish. Cerrini s first known work is an altarpiece for the right transept of S Maria in Traspontina, Rome: the Apparition of the Trinity to Mary Magdalene de Pazzi, datable 1639 on the basis of a dedicatory inscription by the patron. It is stylistically close to two documented canvases that are in S Carlo alle Quattro Fontane, Rome: St Ursula (1642) and the Holy Family with SS Agnes and Catherine (1643). 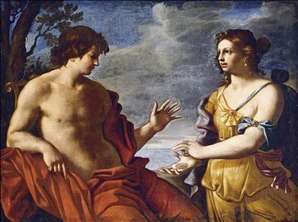 These paintings already possess the characteristics that remained practically constant throughout Cerrini s career: the clear and unitary composition, the almost statuesque postures of the figures (reminiscent of Cristoforo Roncalli) and a chiaroscuro softness like that found in Reni and Guercino. Other works of this period by Cerrini include the Assumption (Rome, S Maria in Vallicella, Spinelli Chapel) and the Woman Carrying Eggs (Rome, Palazzo Corsini). In 1650 he painted an altarpiece for the main altar of SS Carlo e Ambrogio al Corso, Rome, St Carlo Borromeo Praying for Liberation from the Plague (untraced). Works datable to 1655-56 are the Apparition of the Christ Child to St Anthony (Rome, S Isidoro) and David (Rome, Galleria Spada). In 1656 Cerrini was in Florence, working mainly for the Medici. On the basis of Grand Duke Ferdinand II s inventories, some works were identified from that period, among which are the lunette showing St Augustine in the church of Santo Spirito, Florence, Moses and Aaron (Arezzo, Accademia Petrarca) and St Jerome (Florence, Certosa del Galluzzo, Pinacoteca). After Florence, Cerrini may have visited Perugia, where guidebooks by Orsini and Siepi mention numerous paintings that have since been dispersed. In 1663 Cerrini produced his most ambitious work, the decoration of the cupola of S Maria della Vittoria in Rome, with the Assumption of St Paul. Among his last works are the Miracle of St Blaise (Rome, S Carlo ai Catinari) and the Blessed Amadeus Kneeling before the Virgin (Rome, SS Sudario dei Piemontesi), which was commissioned around 1667. See more details about "Apollo and the Cumaean Sibyl"